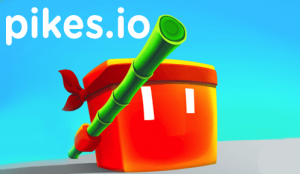 Pikes.IO – Review, Strategy, Tips & Tricks! Pikes.io takes on a medieval combat theme, with players going up against one another in a free-for-all jousting tournament. Do you have what it takes to pick up your spear and ride in battle with thousands of other knights for fame and glory? Play Pikes.io and find out. The game play of Pikes.io is deceptively simple. You control a virtual knight via a top-down view using your mouse. Point your mouse to a certain area inside the battlefield and your knight will ride to that location. You’ll also find colorful squares that you must collect in order to fill up the Boost bar. The longer your pike, the greater you can reach and gain an advantage in poking other players. Various in-game mechanics make the play more interesting. For instance, you can hit the space-bar or do a left mouse click to get a nice speed Boost. The higher your Boost bar, the longer you can speed up. Aim your pike at an opponent, and if you’re successful, you’ll kill them. Killing online players will also make your pike longer, thereby giving you more chances to reach the top of the leader-board rankings. It’s a kill or be killed scenario each time you click “Play”. When you die, you get a chance to be revived by watching an ad. You also get to see a chart of how well you did, including Kills, Score and Game Time. The colorful square littering the landscape will fill up your boost bar, so don’t waste your time collecting them if you’re more than halfway full. The goal should always be to strike when there’s an opportunity to lay waste to an enemy. Get into a rhythm of collecting a few squares, then seeking out an opponent to poke. Don’t be afraid to hit the space-bar or the Left Mouse to continually boost because the squares regenerate quickly. There’s no practice mode on Pikes.io, so you’ll have to learn how to poke other knights the hard way. Moving your mouse will direct your avatar to that spot; once you see a combatant, try to put your mouse cursor to that target and follow the movement as best as you can. If you have the longer stick, chances are that you’ll land a kill. Fighting an opponent who has a longer spear is a bit more tricky, but it can be done. Instead of charging headlong, try to flank them at the weak side and establish a poke at the rear. Catch them by surprise by moving to the side and using your Boost to gain the upper hand. Go straight whenever you’re collecting squares or finding opponents. This makes pointing the pike easier and gives other players pause, especially if you have a longer stick. Keep an eye on your sides for surprise attacks and use Boost to get out of the way; follow up with a flanking move that guarantees a high chance of a kill.